Shampoo ( Passion Fruit Pink ) 1000 ML. Shampoo ( Mango Orange) 1000 ML. Shampoo ( Strawberry Red) 1000 ML. Shampoo ( Blueberry Blue ) 1000 ML. Shampoo (Cantaloug Green) 1000 ML. Shampoo ( Mango Orange) 400 ML. 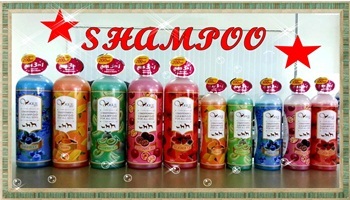 Shampoo ( Strawberry Red) 400 ML. Shampoo ( Blueberry Blue ) 400 ML. Shampoo ( Passion Fruit Pink ) 400 ML. Shampoo (Cantaloug Green) 400 ML.